Proportion of survival of 55 big sagebrush populations (5 subspecies: cytotype combinations) when planted in a common garden in Ephraim, Utah. Dark colors indicate higher proportion of mortality while light colors indicate higher proportion of survival. Mortality rates are correlated with precipitation and temperature interactions -- seed sources with warmer, longer and drier summers suffered higher mortality at Ephraim. This project is done with Bryce Richardson at the USDA Forest Service, Rocky Mountain Research Station, Shrub Sciences Lab in Provo, UT. Big sagebrush (Artemisia tridentata) is the foundational species of the sagebrush ecosystems that dominates western North America. This important perennial shrub occupies less than half of its historical range, due to increased disturbances such as fires, grazing, and plant invasions. Big sagebrush declines have severely affected more than 350 sagebrush-associated plants and animals that are now of conservation concern. Of particular interest is the imperiled sagebrush-obligate bird, greater sage-grouse. The ability to successfully restore big sagebrush is limited by our information on how big sagebrush can adapt to its environment. 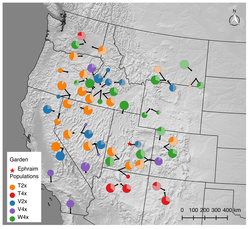 Sagebrush restoration is complicated due to taxonomic uncertainty and genetic variability. Big sagebrush is divided into three widespread subspecies, tridentata, wyomingensis, and vaseyana. These subspecies differ in morphology, chemical composition (e.g., volatiles), genetic architecture, and are adapted to different habitats. Despite the vast majority of sagebrush restoration efforts occurring in subspecies wyomingensis habitat, it has been primarily seeds from subspecies tridentata that have been used in restoring big sagebrush communities, likely resulting in ineffective restoration efforts. Planting big sagebrush seed sources outside its adaptive breadth can lead to unsuccessful restoration including ecosystem degradation and encroachment of invasive species. I am working to understand local adaptation in big sagebrush. More specifically I am interested in how climate influences population differentiation throughout a species range. Plants that are locally adapted to one environment will have a decrease in fitness and performance in an alternative environment. I am assessing how source climate affects survivorship in a new climate due to management efforts or climate change. Future work involves understanding what traits are important for competition in big sagebrush, and if there is genetic variation for these traits.